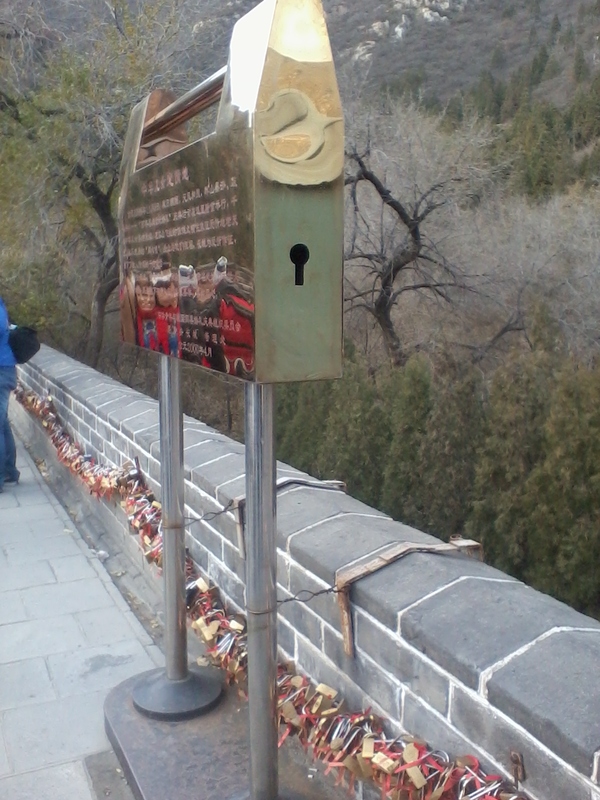 There are a series of chained padlock on a place in one side of the Great Wall. On each padlock engraved the names and hopes. The people who put the lock there usually couples who expect their relationship established and timeless love as the Great Wall. However for me as a muslim, it is such a false belief because of seek for hope to other than Allah, the Eternal Refuge. After took a shopping at the market of exotic, Tianjin Tanggu Yanghuo Market Pedestrian Streets, and find an original tea gift shop at the Xiugu Commercial Plaza, we went to Tanggu mosque which is laid on Zhongxin North Road to take a prayer. It was during festival, there were a lot of activity in the courtyard of the mosque. Spilled blood of slughtered livestocks, some cattles were still waiting to be slaughtered the next day. While the kitchen was busy preparing the celebration. When the time for evening prayer come, we wait about 15 minutes for congregation. One by one came to take sunnah prayer and then came out. After a while, somebody echoed the prayer call in front of the mosque, a few people came in to the prayer hall. We conduct the evening prayer in congregation. 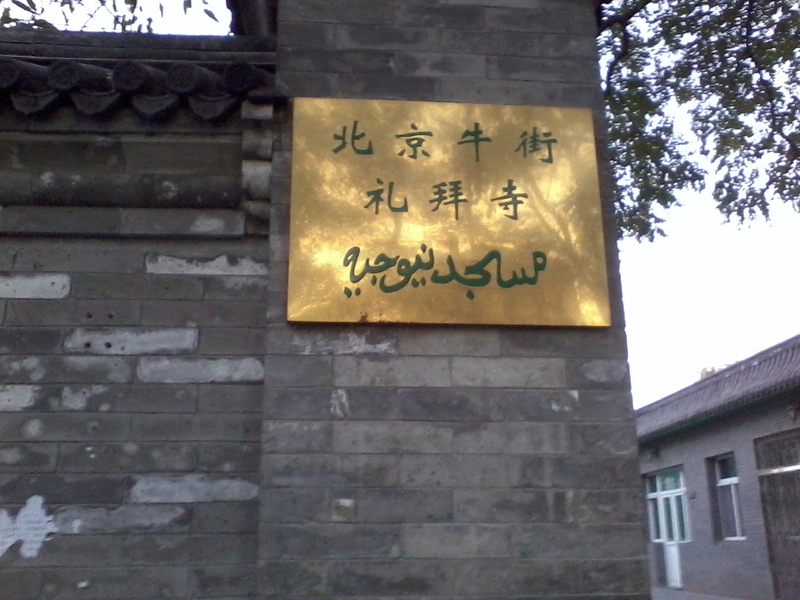 is the writing that almost always be seen at every gate of muslim worship building which I visited in China. 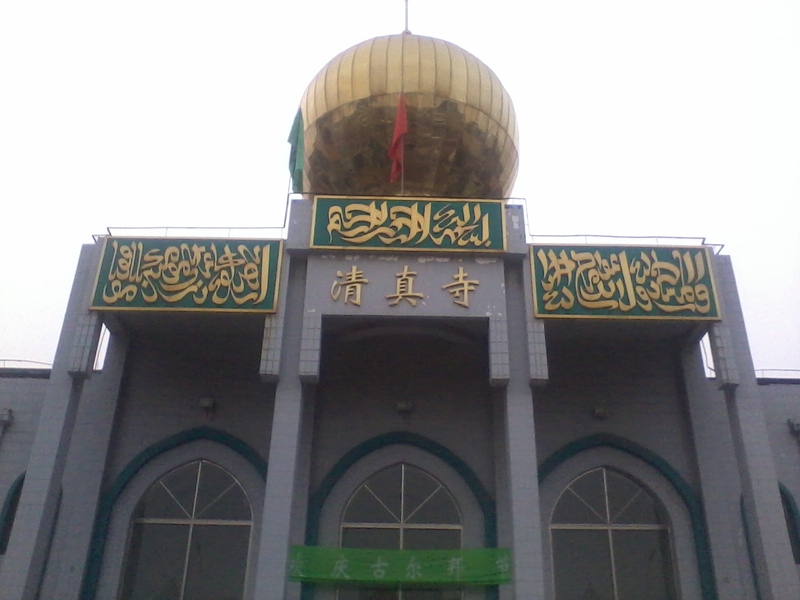 At Niujie mosque in Beijing, Dalian mosque in Dalian, Tanggu mosque in Tianjin, and Dongsi mosque in Beijing. It literally means mosque, but my Chinese friend always said that is Muslim temple. So then, I tried to figure out the basic words that formed it by breaking it down. First word 清 means “clear”. Second word 真 means “true”. Third word 寺 means “temple” or “place of worship”. The first and second words can be combined as 清真 which is means “halal” or “muslim”, or can be combined as 真清 which means “really clear”. Presumedly the word is first mentioned when the Chinese people see the Muslims have a rule to only eat halal food, clearly permissible, not doubtful or which is still not clear and even unlawful or prohibited. This famous quote of Mao Zedong inspires millions of tourists visiting the Great Wall each year. 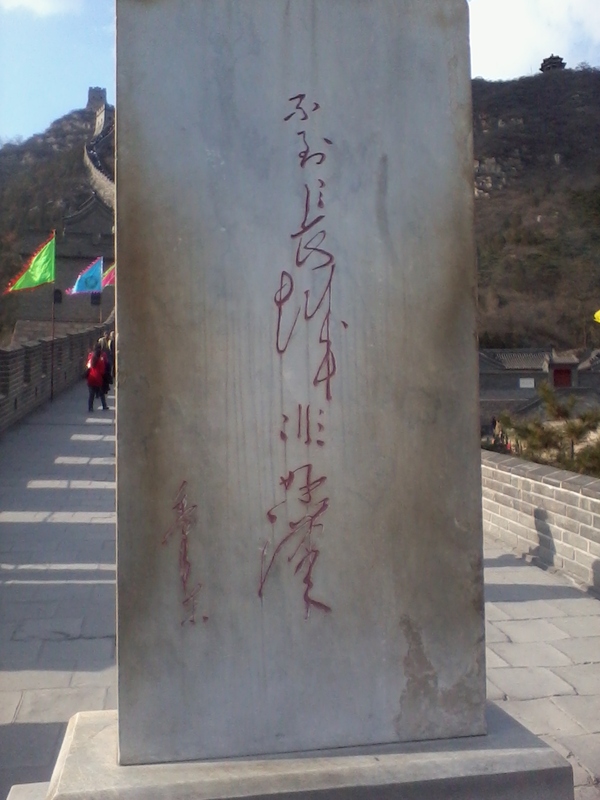 And on this autumn I was feel fortunate to have a chance visit the Great Wall. Badaling is by far the most popular Great Wall of China site for travelers, mainly because it is close to Beijing (less than two hours away) and is much easier to climb than the other Great Wall sections. The Badaling section was built around 500 years ago – and was extensively renovated by the present Chinese government over the last several decades. Be mindful that Badaling swarms with tour groups, individual tourists and hawkers – and has become somewhat tacky. This could taint your photographs and memories of an otherwise visually striking Great Wall of China site. Semakin banyak disposisi yang mampir ke meja kita dan manajemen surat menyurat kita masih first in first out ataupun berdasarkan urgensinya, mau gak mau, semakin kita akan mendapati meja kerja kita berisi dengan kertas-kertas. Dan seringkali kita menyayangkan untuk menyingkirkan semua berkas itu dari meja kita dengan alasan masih berguna ataupun masih diperlukan andaikata dipertanyakan. Clean desk management sudah diberlakukan di level manajemen yang lebih sering menerima tamu, tentu saja akan merepotkan dan mempermalukan diri apabila terlalu banyak tumpukan kertas di mejanya. Lalu bagaimanakah jika clean desk management mulai diterapkan di level worker, yang jelas-jelas bekerja dengan semua kertas dan disposisi dari atasannya? Aniway, happy clean up days! Musilin is Chinese pronounciation for Muslim (穆斯林, read: Mùsīlín), people who embrace Islam as their way of life. Muslims already in China since the first century the spread of Islam outside Arabia. During my visit to China, I took myself to visit the Muslim’s heritage, especially the mosque, which is always said by the chinese as the muslim temple. The Niujie Mosque, also known as Cow Street Mosque (Chinese: 牛街清真寺; pinyin: niújiē qīngzhēnsì; literally “Cow Street Mosque”) is the oldest and the largest of all mosque in Beijing, China. It was first built in 996 during the Liao Dynasty (916-1125). The local Muslim community was forbidden from constructing the mosque in a style other than traditional Chinese architecture, with the exception that the use of Arabic calligraphy was allowed. It was rebuilt in 1442 in the Ming Dynasty and was reconstructed and expanded as well as enlarged in 1696 under the Qing Emperor Kangxi (1622-1722) of the Qing Dynasty. The street where the mosque laid was named with Cow Street or Niu Jie, because muslims like to eat the cow meat of beef. And there are many vendors who sell the beef along the way. I went to that place when the dusk just before evening prayer. Having prayer in congregation with local residents was a very interesting experience. The prayer is, as commonly, conducted in Arabic language. Immediately after the prayer, followed by sunnah prayer before doing zikr. While the zikr can be done individually. Although China is not an Islamic country, muslims who live in China are still allowed to live their Islamic teachings properly, and call to prayer still can be echoed on every prayer time but no loudspeakers. This mosque is one of the living proof of harmony Islam brought to the people of China. “According to local government regulation, facebook, twitter and other social networking is not allowed and disabled from our internet service.” It is stated when you click a user agreement during your use of internet services at Shangri-La Hotel Kerry Centre, Beijing and Shangri-La Hotel Dalian in China. Also in public internet such as airport and wi-fi spots. And so does at The Peninsula Palace Hotel, Beijing. Almost at every internet spot do not allow access to that kind of pages. Even accessing wordpress is disabled. This kind of policy made me wonder if facebook, twitter, wordpress are harmful or act as a threat to people of China? Or just as my company does, that those kind of pages are huge consumed of bandwith and never increase any productivity of the workers? You are currently browsing the di pondok kecil blog archives for November, 2010.